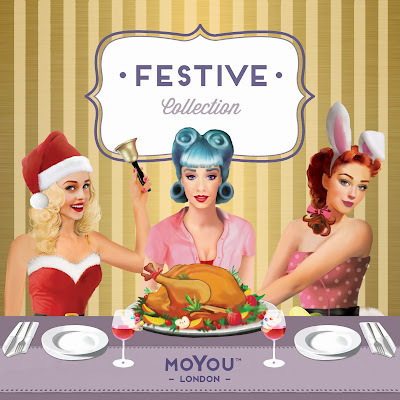 Lacquer Lockdown: Hot Off the Stamping Press: MoYou London Festive Collection! Hot Off the Stamping Press: MoYou London Festive Collection! More good news! Lol maybe some bad news for your wallet and a shocking double post from me today. Because, yup you guessed it, there are even MORE new plates coming down the pipelines. MoYou London is really on fire right now creating so many amazing designs that leave this little stampers heart fluttering. 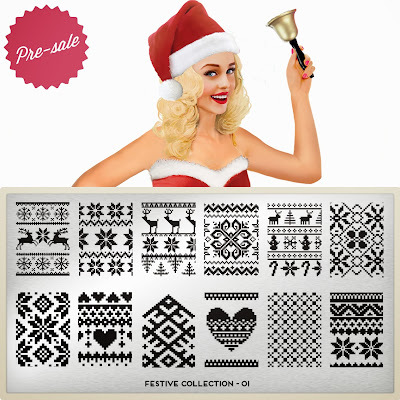 This time the creative team has launched a collection themed around holidays called the Festive Collection. Let's take a look shall we? Look at all the amazing detail on this plate! The little north pole sign, the sleigh and reindeer, a shooting star. It's really unbelievable! As you can see the plates are themed around the Christmas and New Years holidays, but a pretty little birdy told me there will be more plates associated with other holidays coming soon! I have to say as usual I am so impressed with the MoYou teams' creativity. In particular, I love how they have created an entire image and packaging to each collection that defines this brand. I also can personally attest to the high quality of these plates which makes it somehow impossible to resist whenever they drop a new collection. Oh I love all of these! Super cute! I really love the one with all the sweater designs!